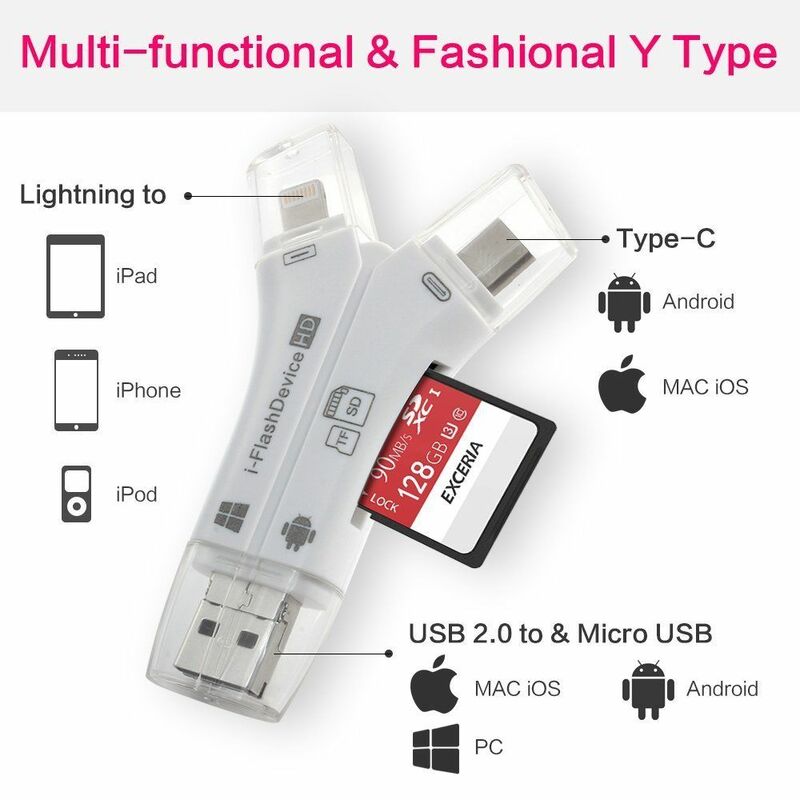 4 in 1 OTG lighting USB C Card Reader for iPhone/ iPad/ Mackbook/ Android/ Camera. Compatible models:	Macbook Pro 2016/2017 13 and 15 inches	iPhone 7, 7 Plus iPhone 6,6s,6 Plus,6s Plus iPhone 5,5S,5C,5SE iPad Pro, iPad Air, iPad Air2, iPad 4 iPad mini 2,3,4 LG G5 G6 V20 Nexus 5X 6P Samsung Galaxy 3 S4 S5 Note2 3 4 5,S8, S8 Plus. Other Android Smart Phone/tablets. (Please mark sure your phone support OTG/Type-C function.) Function:(For iPhone/iPad/iPod) 1. 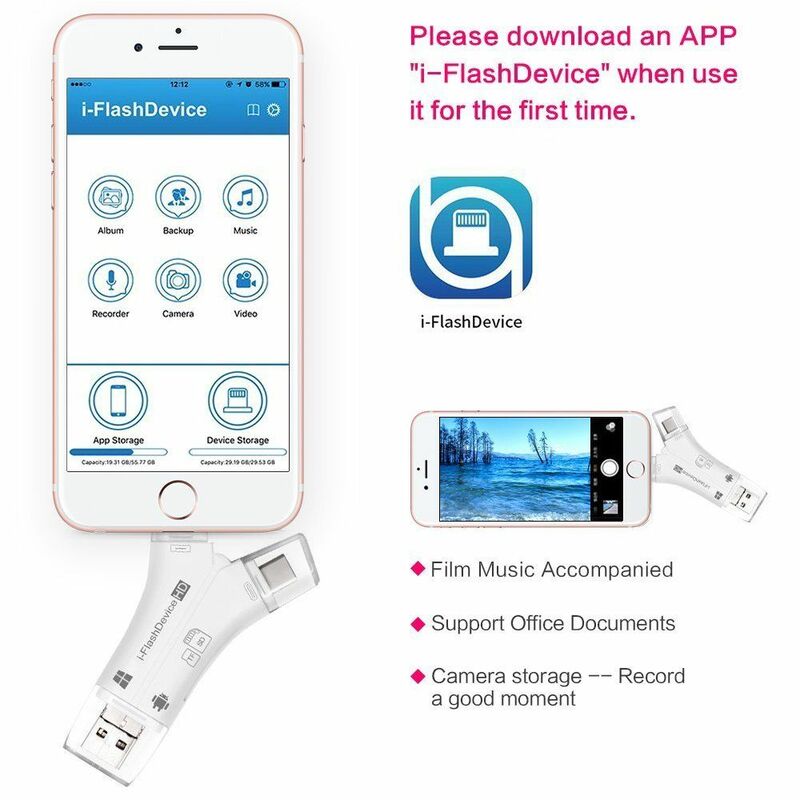 Recording IOS system cannot directly removed the tape with each other, only can transfer out by Email, Now you can put the data transfer out without network as long as using the recording function of i-flashdevice. 2. Contacts backup IOS system cannot backup contacts, i-flashdevice can realize to backup and restore without network. 3. Mobile office You can rapid modified the document in i-flashdevice and transfer out by Email or 3G/4G at any time. Make your office work portable and shortcut. 4. Share You can copy/cut files between IOS device and SD/TF card just use iphone ipad. Free to share the files, Videos, music in your i-flash drivelide with your friends. Features: NOTE: Never use both connections simultaneously . Insert no response :(Please inserted memory card into card reader first, then plug it to phone. ) 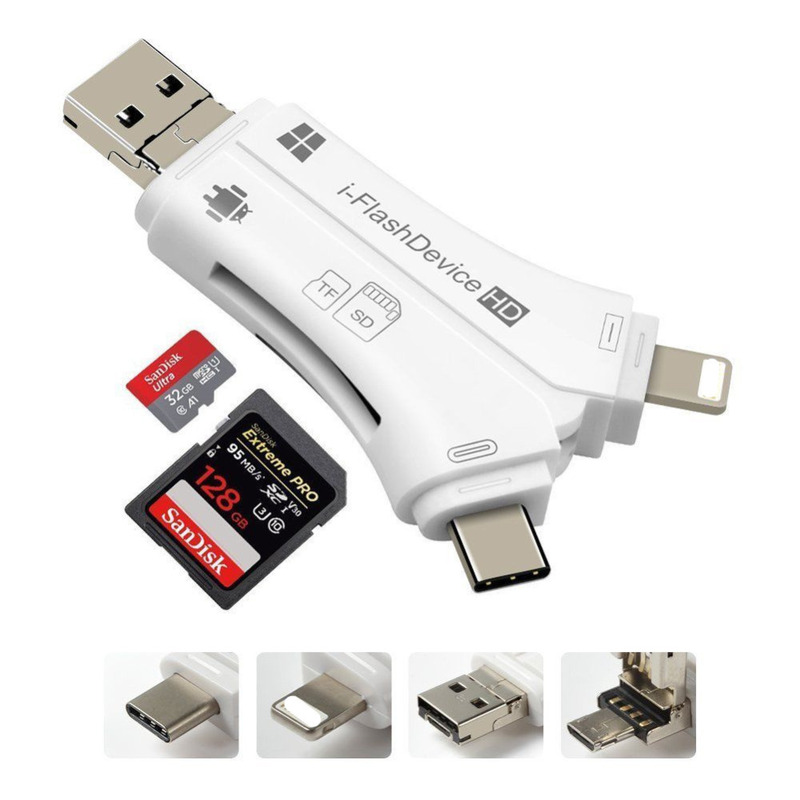 For OTG/Type-C Android phone: 1.Please enable OTG storage function in the Phone\'s setting menu. 2. Google Nexus 5/6/7/9/10 with help of third-party app such as Nexus USB OTG file manager, ES file explorer, Nexus media importer. For IOS iPhone/iPad/iPod: 1. Please Uninstall the old app, then re-install the latest app named “i-flashdevice”. 2. Please format your memory card to FAT32 system. IOS system not compatible with NTFS & exFAT formats. 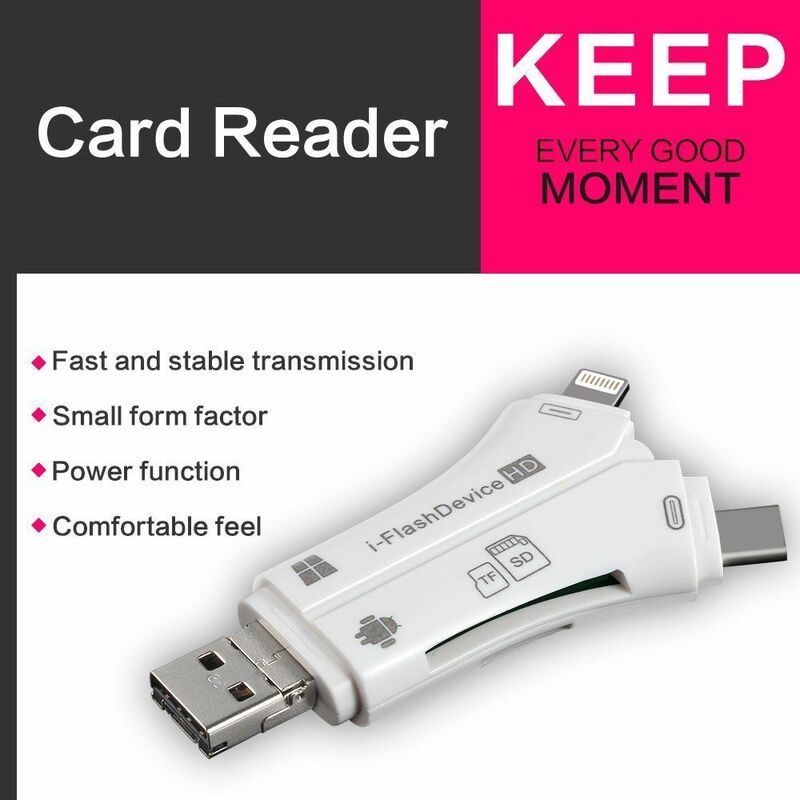 Package Content: 1 X 4 in 1 USB C Card Reader, 1 x User Manual.